Are you shopping for a new vehicle that can meet your needs and the needs of your dog? If so, we can help at The Car Store. 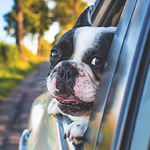 There are many factors that you should consider when you are looking for a dog-friendly car, such as making sure that there is enough room for your dog to enter and leave the vehicle. When a dog gets hot, it pants, so you need to choose a car that provides your dog with plenty of fresh air. Try to go with a vehicle that has backseat air ducts. You should also look for vehicles that have backseat climate control that is independent from the front seats. The shape of the backseat should also be considered. If you have a smaller dog, then sculpted seats may be ideal so that you pup can easily nest in the seats. On the other hand, large dogs may do better with a bench seat that provides them with plenty of room to stretch.